In this startlingly original and persuasive book, Raymond Tallis shows that it is easy to underestimate the influence of small things in determining what manner of creatures humans are. He reveals that over time the repeated and multiple effects of the seemingly insignificant can make an enormous difference and argues that the independent movement of the human index finger is one such easily overlooked factor. Indeed, not for nothing is the index finger called 'the forefinger'. It is the one we most naturally deploy when we want to winkle things out of small spaces, but it plays a far more significant role in an action unique to us among primates: pointing. In Michelangelo's Finger, Raymond Tallis argues that it is through pointing that the index finger made a significant contribution to hominid development and to the creation of a human world separate to the rest of the natural world. 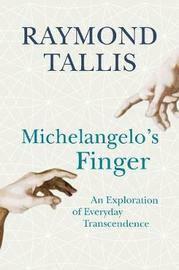 Observing the ceiling of the Sistine Chapel and the hugely familiar and awkward encounter between Michelangelo's God and Man through their index fingers, Tallis identifies an intuitive indication of the central role of the index finger in making us unique. Just as the reaching index fingers of God and Man are here made central to the creation of our kind, so Tallis believes that the simple act of pointing is central to our extraordinary evolution. Raymond Tallis was Professor of Geriatric Medicine at the University of Manchester until 2006. A poet, novelist and philosopher, he was listed by the Economist in 2009 as one of twenty living polymaths, by the Independent in 2007 as one of fifty 'Brains of Britain' and in 2005 Prospect magazine named him as one of Britain's leading Public Intellectuals. The Raymond Tallis Reader was published in 2000, Hippocratic Oaths in 2004 and The Kingdom Of Infinite Space in 2008.